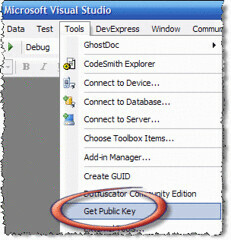 David Bailey from RDA Corp clued me into a very slick way to obtain the public key token and blob for a signed assembly directly from within Visual Studio 2005. This is a common task for Web Part developers as we need the public key token when creating <SafeControl /> entries in the web.config among other places in SharePoint. 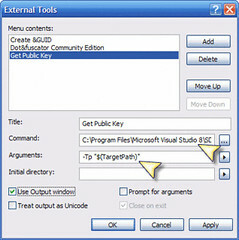 However, there's an even easier way using the external tools dialog in Visual Studio 2005 which David demonstrated in our SharePoint Developer class earlier today.